The oldest known fossils assigned to Equidae date from the early Eocene, 54 million years ago. They used to be assigned to the genus Hyracotherium, but the type species of that genus now is regarded to be not a member of this family. The other species have been split off into different genera. These early Equidae were fox-sized animals with three toes on the hind feet, and four on the front feet. They were herbivorous browsers on relatively soft plants, and already adapted for running. The complexity of their brains suggest that they already were alert and intelligent animals. Later species reduced the number of toes, and developed teeth more suited for grinding up grasses and other tough plant food. The family became relatively diverse during the Miocene, with many new species appearing. 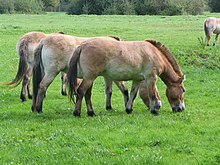 By this time, equids were more truly horse-like, having developed the typical body shape of the modern animals. Many of these species bore the main weight of their bodies on their central, third, toe, with the others becoming reduced, and barely touching the ground, if at all. The sole surviving genus, Equus, had evolved by the early Pleistocene, and spread rapidly through the world. Order Perissodactyla (In addition to Equidae, Perissodactyla includes four species of tapir in a single genus, as well as five living species (belonging to four genera) of rhinoceros.) † indicates extinct taxa. ^ Palmer, D., ed. (1999). The Marshall Illustrated Encyclopedia of Dinosaurs and Prehistoric Animals. London: Marshall Editions. p. 255. ISBN 1-84028-152-9. ^ MacFadden, B. J. (March 18, 2005). "Fossil Horses--Evidence for Evolution". Science. 307 (5716): 1728–1730. doi:10.1126/science.1105458. PMID 15774746. ^ Savage, RJG & Long, MR (1986). Mammal Evolution: an illustrated guide. New York: Facts on File. pp. 200–204. ISBN 0-8160-1194-X. 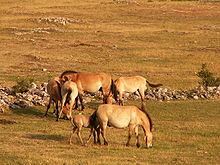 Look up Equidae or equid in Wiktionary, the free dictionary. This page was last edited on 3 April 2019, at 23:01 (UTC).